I will introduce 'Ikebana',Japanese flower arrangement in this page. I is a traditional life art using cut flowers. The origin of flower arrangement is said to be the dedication of flowers in front of Buddha's statue which was introduced from China in 6th century. In Heian era (8-12th century) there was a habit to appliciate the flower in the bud vase. Construction style and Tea ceremony were deeply related to the consolidation of flower arrangement. To decorate 'tokonoma' (alcove), gorgeou flowers were arranged. At the tea ceremony, simple flowers were used to decorate the tea house. From mid to late Edo era, flower arrangement widely spreaded among common people, especially 'shoka, or seika' style. Presently flower arrangement indicates this style. At this time, many master appeared and schools were devided into many sects. From the late 19th to mid 20th century, many young ladies learned flower arrangement as the essential manner before the marriage. Recently, various materials (not only plants) were taken into flower arrangement and changed to contemporary style. Rikka: Using the vase of narrow neck and widely opened mouth and branches are binded by straw. Put the main branch in the center and put side branches on both sides considering the balance. Seika: The number of side branch is less. It emphasizes the beauty of the simple line by few flowers. Nageire: In narrow and tall vase, arranging simply by respecting the flavor of branches and flowers. Bunjinbana: It is similar to Nageire, but Nageire has certain form. In Bunjinbana, the form and the combination of flowers and vase is free. It introduces the taste of Bunjin (man of literature). 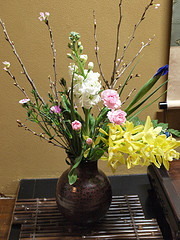 Moribana: The modern style of arrangement using flat vase. It aimed sketching the natural landscape, making it colorful, and designing. Stopper called Shippo and Kenzan are used to fix the flower. Jiyuka: Contemporary style, getting away from the form and traditional way, and arranging with imagination. Compositing the material by line, surface and mass. Vase is also considered as a material. In Western flower arrangement they compose the flower as a design, but Japanese expresses the life of the plants on the piece. We use not only flowers and grasses, but also branches. Western arrangement is often put on the table center, so you can appreciate the beauty from any angles. Japanese arrangemet is supposed to be appreciated from certain angle by putting on 'tokonoma' (alcove).